Fast, Reliable High-Impact Color for Small Businesses. The Brother MFC-9330cdw is an ideal choice for the small business looking for a fast, reliable digital color All-in-One with duplex (2-sided) printing. It packs big business features like a 3.7" color Touchscreen display and wireless networking into an affordable, compact device designed to fit your small business workspace and budget. It prints and copies high-impact color and crisp black documents at up to 23ppm, and scans and faxes too! It's perfect for businesses that primarily produce black business documents, but also need to print professional-quality color documents in-house from time to time. It also offers wireless printing from your mobile device via± AirPrint®™, Google Cloud Print™, Brother iPrint&Scan, Cortado Workplace and Wi-Fi Direct™. Blazing Fast Printing. Fast color and black printing - up to 23ppm to help improve your productivity. 3.7" Color Touchscreen Display. Easily navigate menus by tapping or swiping on the 3.7" color Touchscreen display with Web Connect‡. Connect to the web directly from the Web Connect Touchscreen Interface to access your account on EVERNOTE, DROPBOX, or BOX or more‡. High-Impact Business Printing. 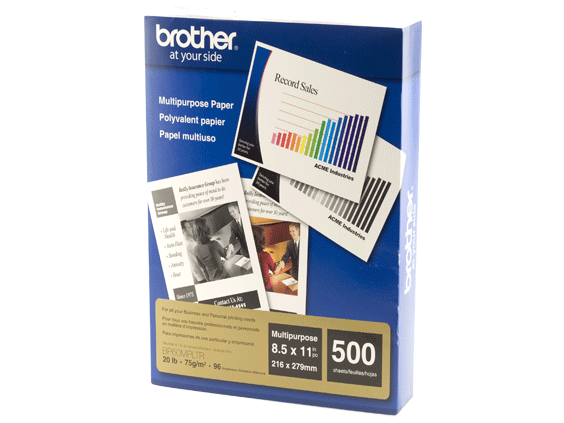 Produce crisp black and high-impact color business documents at up to 600 x 2400 dpi resolution using Brother's Digital LED print technology. Flexible Connectivity. Built-in wireless and Ethernet network interfaces to install on a wired or wireless network or connect locally to a single computer via USB‡. Versatile Paper Handling. 250-sheet capacity paper tray adjustable for letter or legal and a straight-through paper path via manual feed slot for envelope printing. Help Lower Your Operating Costs. High capacity color toners available (approx. 2,200 pages each‡) to help lower your cost per copy. High Quality Scanning. Up to 19200 x 19200 dpi (int.) resolution with a variety of "scan to" features. Mobile Device Printing. Wireless printing from your mobile device via‡: AirPrint®, Google Cloud Print™, Brother iPrint&Scan, Cortado Workplace and Wi-Fi Direct®. Automatic Duplex Printing. Automatic duplex printing to help save paper. Help Control Your Color Printing Costs. Use the Secure Function Lock feature to set color page counts or restrict color printing for up to 25 users. USB Direct Interface. Print from or scan to your USB flash memory drive‡. 23.625" x 21.0" x 21.875"
16.1" x 19.0" x 16.1"
Best Transmission Speed (approx. sec./page)‡ Based on ITU-T Test Chart #1 at standard resolution with JBIG compression. Broadcasting (# of locations) Black/White only. Call Waiting/ Caller ID/ Distinctive Ring Ready‡ Distinctive Ring Ready‡ Check with local phone company for service availability. Cloud Services (Web Connect)‡ In order to use Brother Web Connect, you must have an account with the desired service. If you do not already have an account, use a computer to access the web site of the service and create an account. In order to use Brother Web Connect, your Brother machine must be connected to a network that has access to the Internet, either through a wired or wireless connection. Fax Page Memory (max. pages)‡ Based on ITU-T Test Chart #1 at standard resolution with JBIG compression. "In-box" Consumables/Yield‡ Approximate toner cartridge yield in accordance with ISO/IEC 19798 (letter/A4). Drum yield is approx., and may vary by type of use. Quick Scan/Memory Transmission (approx. sec/page)‡ Based on ITU-T Test Chart #1 at standard resolution with JBIG compression. Standard Input Paper Capacity (sheets)‡ Maximum capacity based on using 20 lb paper.